Stainless Supplies is continually striving to meet the ever changing demands, requirements and needs of the manufacturing industry on a national and international scale. Our Flexible approach towards individual requirements means we can showcase our ever expanding portfolio of capabilities allowing us to provide each customer with a reliable and trustworthy manufacturer within their supply chain. The processes within Stainless Supplies have been tailored to suit our working environment. From placement of order through to dispatch each product passes through a quality control check to ensure they meet the high standards that we pride ourselves on. We operate internally with ISO9001 standards and have built our reputation on reliability and quality. We also supply bespoke large and unique product designs for process plant and industrial applications, building construction companies, and specialize in made to order shop fitting and retail equipment. We are now able to offer a laser cutting/profiling service - quotes are available for jobs of any quantity. See our laser cutting information page for more details or contact our Sales team to discuss your requirements. Our Bystronic Bystar 3015 sheet metal laser cutting/profiling machine provides a wide range of benefits to our customers. With a typical cut accuracy of +\-0.1mm each profile is consistent. Laser cutting provides customers with a product that can, in most cases, be immediately integrated into their product. 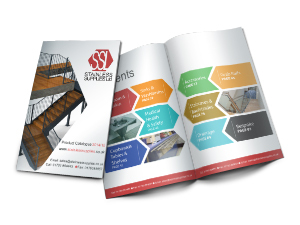 Whether you are looking for standard catalogue products or bespoke designs using stainless grade 304, 441, 316 or 430 material, we manufacture to the same high standard and attention to detail. As testimony to our care and service our valued customers include the British aerospace industry, building industry associations and architects, council authorities and leading builder and plumbing merchant networks. For projects that require the durability and hygienic properties of stainless steel, Stainless Supplies Limited is the ideal partner for developing and supplying cost effective, quality solutions. Please feel free to contact us with your requirements... we are here to help.